Today is World Suicide Prevention Day, which highlights the impact of one of leading causes of premature and unnecessary deaths worldwide. We share some fast facts about suicide, what you can do if you’re concerned about someone, and where you can get help from. Suicide can be a difficult topic to talk about. But it’s critical to challenge any negative stigma and stereotypes in order to offer help to those who need it . This year we’re focusing on ‘working together to prevent suicide’, and that means reaching out to our family, friends, community, and health professionals to encourage action and open conversation. Remember, you don’t have to see a doctor, psychologist, or psychiatrist to get help. You can talk to your friends, family, partner, local community, or anyone who is there to support you. In the same regard, if you know someone who seems a bit down, agitated, or upset than usual, you can support them. This could include giving advice on a situation, helping them find a health professional, or simply asking them if they’re okay. On Thursday the 13th is R U OK? Day, and the perfect opportunity to reach out to someone who you may be worried about. If you’d like to ask but don’t know how to approach the situation, here’s a step-by-step guide. But remember, you are the first priority. Look after your health and wellbeing before you give others support. If the person doesn’t respond well to your question or doesn’t open up, then that’s okay – they may not be in the right place to act yet. The best thing you can do is to tell them that you care and that you’re still concerned about them. Showing that you will remain at their side and support them will mean a lot. You never know how much one question could change someone’s life. If you care about someone, it doesn’t hurt to check in with them. If you need help or support, here are resources you can access. And if you think the person you’re supporting could be suicidal, please call 000. 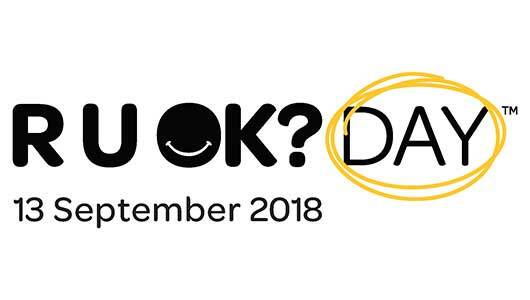 Check out the registered events held for World Suicide Prevention Day in your area, and keep an eye out on how to get involved on R U OK? Day. And next month is Mental Health Week from the 7 – 14th: see how you can get involved in upcoming events.